Today is the last day of the CAL, i am so gonna miss it! I was asked and honored to be the last participant to bring the instructions for the day. I choose the triangle, because of it's symbolic meaning. It represents the past, present and future. The past was to set out on this journey with peers, the present is all the beautiful work in progress, and the future is seeing everybody's finished freeform pieces and looking forward to next year's event. For the instructions the only clue was, to use the triangle shape and/or stitches. This is my triangle scrumble. 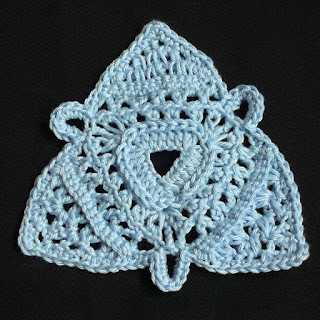 I've used triangle shapes and stitches. Over de test zelf kan ik niet oordelen maar wel over de resultaten. Ik vind het mooi en heb met veel plezier deze hele maand gevolgd. Ik ben benieuwd naar je vest! Dank je wel voor je belangstelling en fijne commentaar deze maand!